The stunning beauty of this coffee-table, art-quality book does justice to its contents. 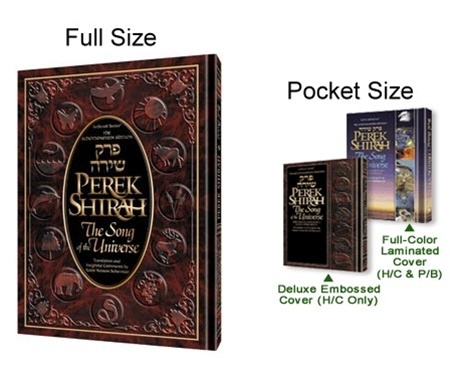 It will make your heart sing along with the universe - perhaps even join the growing numbers who make Perek Shirah part of their day - and it will be a treasured gift to every special family. Pocket-Size Editions: The convenient pocket-size editions have a 4" x 6" page size, ready to take along wherever you go! Contains everything the full-size edition does. Also includes Bircas HaMazon/Grace after meals.